We're back from Blade Show in Atlanta and pretty excited by the response we received. 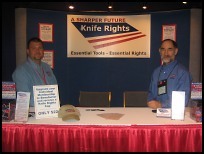 This was our first effort at having a Knife Rights booth at a show and we learned a lot. Special thanks to those Knife Rights members who came by and spelled us in the booth from time to time, and especially to Denis Bechen (left in photo) who committed his entire weekend to assisting us with set-up and take-down and manned the booth for most of the show. Volunteer dedication like this is the foundation upon which we will build a strong and effective organization. "Our Second Amendment rights mean more than just owning and possessing firearms. What too few people know, is that the right to own edged weapons was also our Founding Fathers’ intent, and that right is under assault in every state and in many nations. Legislators are ill-informed regarding Knife Rights! The canny liberal left works feverishly to ban all perceived bad things with simple language changes that go unnoticed by American citizens. We realize the dangers of law abiding customers becoming felons by this assault. 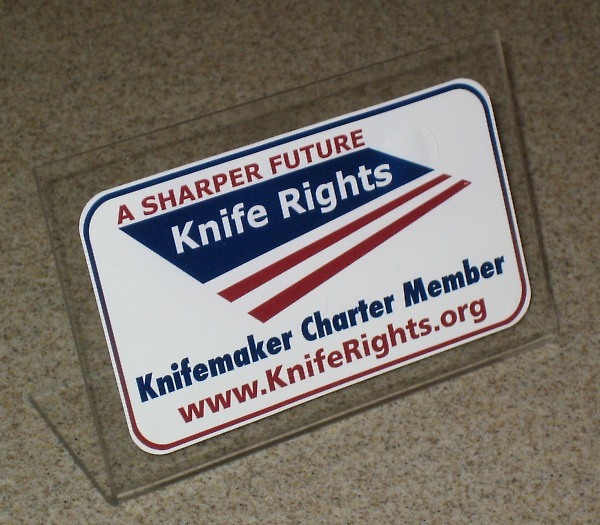 It is time to build a grass roots movement that is the voice of the Knife Owner. Much like the NRA, we need a strong group that is our legislative advocate, organizer and protector of our rights. Brigade is honored to join Knife Rights because they have it RIGHT. By working together, using our communication systems, and educating our consumers, we can help Knife Rights become a powerful group that can protect the rights we have always known. I encourage all cutlery companies and retailers to join now in this effort and work together to amass a grass roots organization that is our voice and early warning system for the preservation of knife ownership rights. Thank you, Doug Ritter, for being the voice for all of us." We are very pleased to welcome to Knife Rights a company of Brigade's reputation for "delivering the Goods to the Good Guys." We will be working with Brigade to publicize Knife Rights to their customers, almost all of whom are knife owners. I participated in a Blade sponsored panel discussion, "How To Protect Your Knife Rights" that included David Kowalski, Communications Coordinator of AKTI, and renowned 2nd Amendment attorney Evan Nappen (www.evannappen.com). To say that attendance was small would be an overstatement, which Evan was quick to point out was part of the problem. Most are simply not aware of the threat that exists. It's also a fact that the candy store that is the Blade Show is simply a lot more enticing at 10:00 AM on Saturday than listening to us. On a positive note, almost everyone who attended who were not either affiliated with AKTI or Knife Rights, did come by the booth to join up. Of more significance is that Evan Nappen not only joined Knife Rights, but has volunteered to help us build our Knife Laws portion of the Knife Rights web site. I view this as one of the most important services we'll be able to offer our members and Evan's assistance will make it happen quicker and the results will be far more useful with his commentary and explanations that will cut through the legalese. Simply making the statutes and ordinances laws available is only half the job. Being able to tell our members what exactly what it means as the result of court decisions and interpretations is even more important and eminently more useful. Evan will be working with Knife Rights volunteer Steve Van Dyke and a few others to assemble the database and develop the interface. If you'd like to be involved in this project and have any online database engineering or interface development experience, please drop me an email. We coudl use your help. We'll have more news about this as we get closer to launch. Evan has also committed to allowing us to republish a number of his articles dealing specifically with knife laws. This is part of our effort to provide members with valuable information that they can use to avoid potential trouble or better understand the existing laws. We also signed up a number of new members at Blade Show, as well as made contacts and held discussions with various companies and organizations that should produce further support for Knife Rights as we move forward. The most important thing was our simply being there and raising awareness of Knife Rights. As with any new venture, part of the program is simply establishing credibility by showing up. We are already getting volunteers to hand out buttons and our new promotional cards at their local knife shows and events. If you would like to help in this manner, please email me. If you haven't joined Knife Rights www.KnifeRights.org already, please do it now. If you are a member, please get your friends to join. Just encourage 10 of your friends to join Knife Rights and we'll reward you with an annual membership renewal or equivalent credit towards a higher level of membership. The Knife Rights member who brings in the most new members in the first year will win a custom knife worth over $300! All the remaining Knife Rights members who gained a Member-Get-A-Member award will be eligible to win another custom knife worth over $300! We have made this even easier by providing you a card template that you can use to hand out to your friends. (Get the template here) It includes a place to write your name. Just print them out on standard business card sheets or make your own from scratch on plain paper and a scissors or paper cutter. All they need to do is go to www.KnifeRights.org and sign up, putting your name down as the referrer. Thanks to member Steve Van Dyke for helping develop this. Please forward this email to anyone you know who might be interested in Knife Rights.